JVS check valves incorporate a metal to metal seal for high pressure and high temperature environments where elastomer seals cannot be used. The check valves are available in standard pressure ratings from 3000 psi to 15000 psi and in sizes from 1-13/16" to 4-1/16". The check valves are used in choke manifolds, christmas tree injection and kill lines. 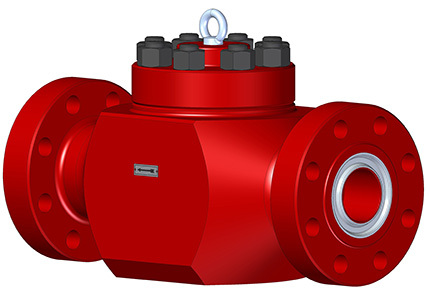 The check valves are suitable for use with oil, gas, water or drilling fluids. Check valves are available in all temperature ratings as well as product specification levels (PSL) as specified in API 6A.